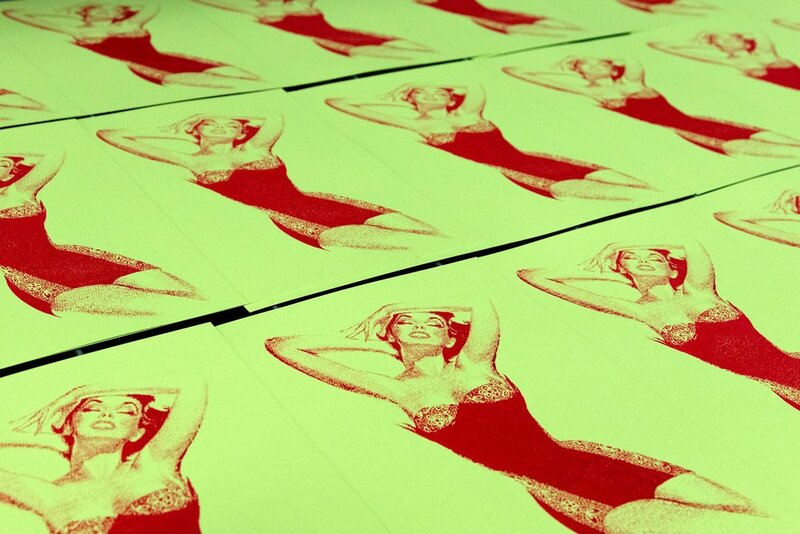 some sneak-peeks of new prints in progress! come out to the Helen DeVitt Jones Print Studio (in the 5&J Building at CASP), & pick up some fresh prints! Can’t make up your mind? Make a heart for your valentine! Show us your heart on a card, t-shirt, or tote! Fun for all ages, kids to adults, couples or not, will find something awesome to print! Come listen to music by KTXT 88.1, with DJs Misery Chick & Stevie Kicks; see some live printing by Victoria Marie Bee; pick up some fresh letterpress prints; &, more! 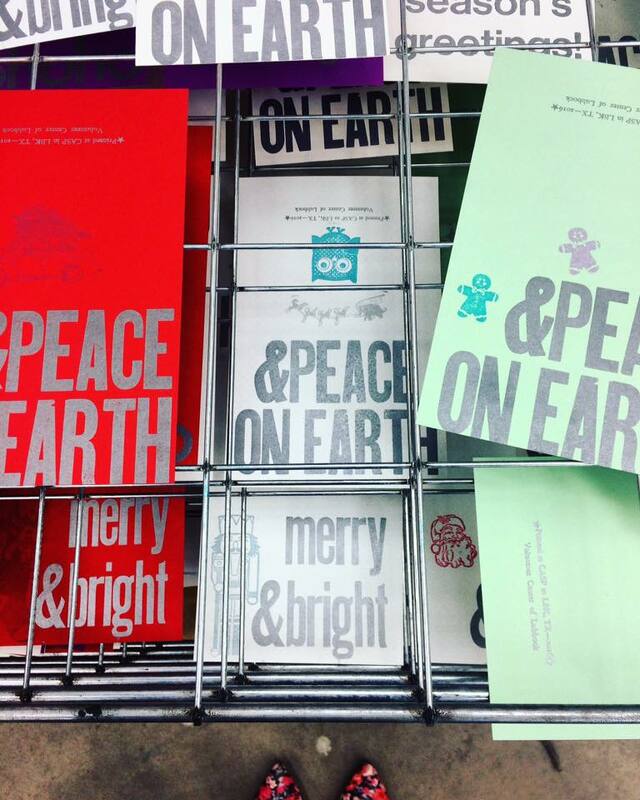 Send a homemade card this holiday season, using letterpress & screenprinting & more! Print 3 holiday cards for just $6! Get one 3ft by 6ft sheet for only $10! Fun for all ages, no previous experience required. Both activities will be available both days! Come & go during the times listed, but since this is one of our most popular events, please expect each activity to take at least 30 minutes. 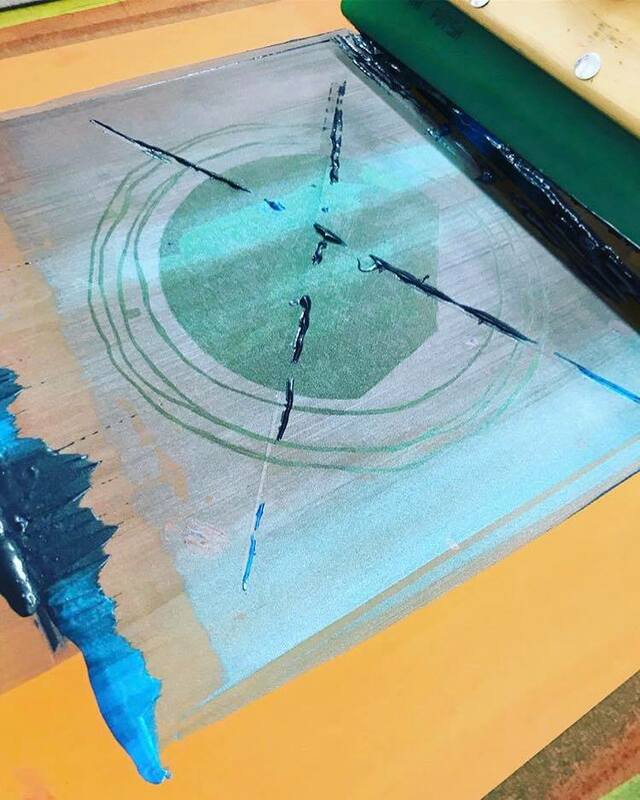 Class times: Wednesday, November 14th, 6PM-8PM (& Saturday, November 17th, 10AM-12Noon) instruction & demonstrations; then after this class students will sign up for times to print their creations during one-hour time slots between 10am-6pm on Saturday the 17th (&, Wednesday evening the 21st)! Class Description: Make a one-of-a-kind t-shirt & learn basics of screenprinting! Students will learn how to create (hand-drawn & computer-generated) designs; how to transfer image into a screen; mixing inks; & more! After completion of the course, students will have a unique one-color t-shirt they designed & printed. This is a limited course, so register today to reserve your spot! CELEBRATE PRINTS-GIVING WITH US THIS FALL! Finish the statement “I am thankful for_______” using wood type & imagery, to letterpress print your own unique poster! PRICE: $5/print. Make as many as you'd like to display your thankfulness, or give to a friend you’re thankful for! MARK YOUR CALENDARS! FEBRUARY 10th! 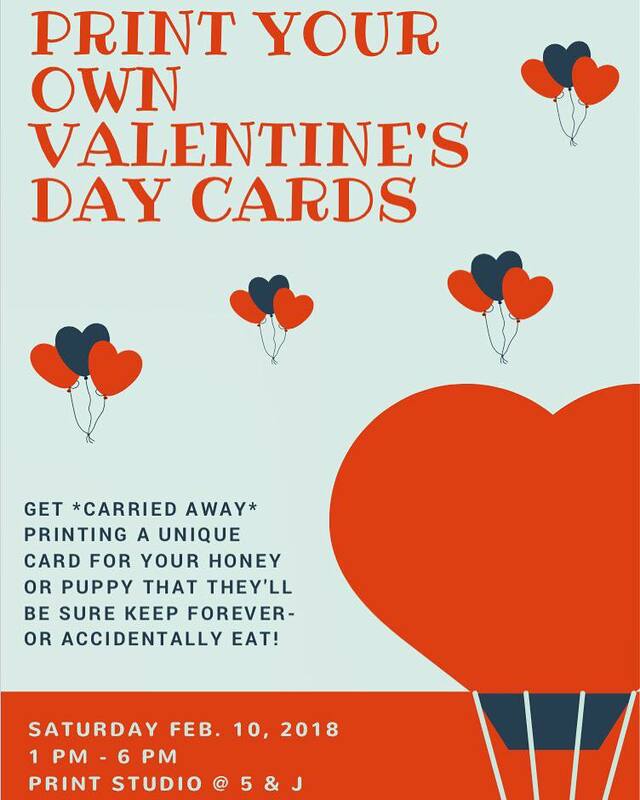 ❤️✨Get *carried away* printing a unique card for your honey or puppy that they’ll be sure to keep forever – or accidentally eat! Lots of options available to print, from super lovey valentines to anti-valentines to funny cards for friends (& more)! No previous experience needed & fun for all ages! Print your own 90's themed t-shirts and tote bags! Trick-or-treat! Come print your own pillowcase (or use one of ours!) for a unique candy collecting bag to use on the 31st and then for naptime fun! Only $5 if you bring your own pillowcase (or t-shirt) or $10 to print on a CASP pillowcase or t-shirt. email v@vmbee.com or sign-up for the newsletter for information about future classes & workshops! xo! Doesn't a loved one deserve a "World's Most OK Dad" shirt? Would it have a picture of Darth Vader on it? Maybe both?! That's up to you! Come join Print Fellows Zack Smith & Stephanie Berrie, for a Father's Day shirt printing extravaganza! Learn how to screen print on fabric, & make a completely original t-shirt. Make one for dad, yourself, or anyone in your life — lots of different designs will be available! Bring your own blank shirt to print on for $6, or let us provide the shirt & pay $10. Come get inky with the CASP Crew! 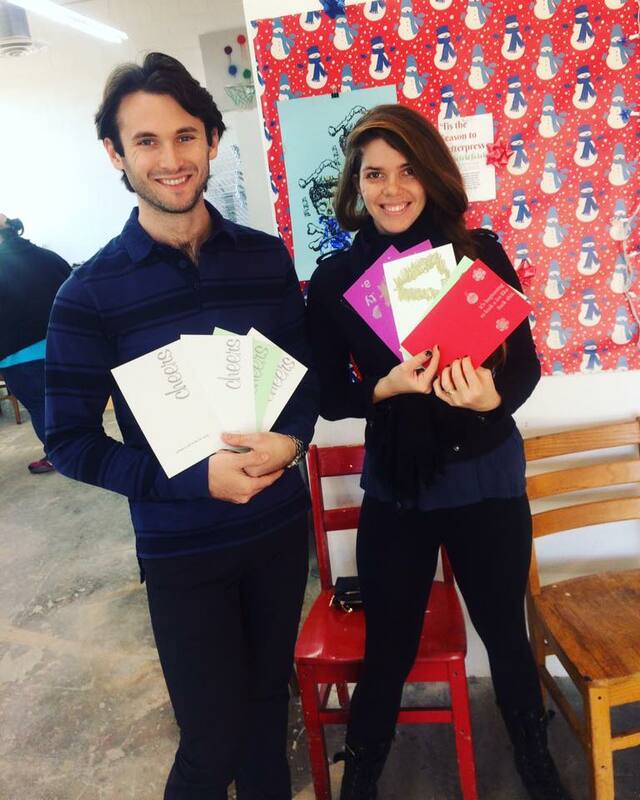 Helen DeVitt Jones Print Fellow Kyle J. Bassett & Artist-In-Residence Victoria Marie Bee will have blank postcards & notecards ready for you to print whatever pithy, yet loving, sentiment you'd like to send to friends & family. 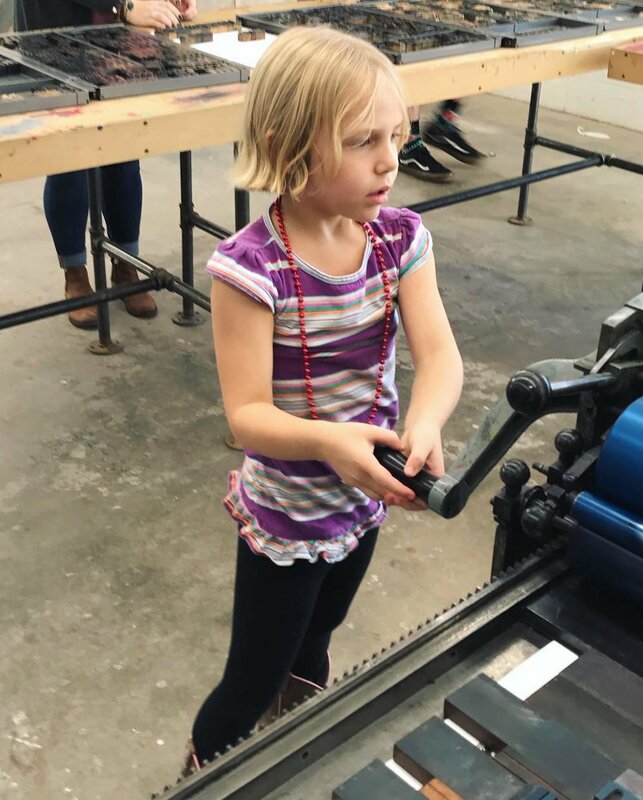 Get hands-on experience in letterpress, silkscreen, & general awesomeness to create unique one-of-a-kind cards! Each card will cost $1.50 (or 4 for $6) to make, so feel free to get extra sassy.